Katelios is a small fishing village on the southeast of the island and 32 kilometres away from Argostoli. Two decades ago in the village there were only fishermen who had their cottages and huts there. Gradually it became much more popular, initially among the residents of Argostoli who chose Katelios for their short excursions because of its local 'tavernas' with the delicious seafood. Since then there has been significant tourist development, although Katelios remains a quiet and peaceful destination, ideal for nature lovers and those seeking relaxation. The village is divided into Ano Katelios where the permanent residents have their properties and Kato Katelios which is the area with most of the tourist accommodation. Despite tourism Katelios hasn’t lost its character and therefore the peaceful and tranquil atmosphere along with the beautiful green surroundings make it a top-notch destination for couples of all ages, families and more mature-minded tourists who want to escape from the city life. The village is situated in a flat large plain with fertile soil watered by the streams of the nearby mountains. The terrain is ideal for walking till the neighbouring villages of Hionata, Mavrata, Markopoulo and Ratzakli. The rural landscape and the beauty of the nature attracts walkers, bird watchers and all sorts of nature lovers from all over the world. From Katelios you can enjoy stunning views of the Ionian Sea until the island of Zakynthos and the western coast of the Peloponnese. Even though there are different types for accommodation, no matter what your preferences are, there aren’t a lot of shops except for some mini markets and a few small souvenir shops. However, the busy village of Skala is very close and there are daily buses to Argostoli as well. Vivid nightlife is practically non-existent in Katelios. Here you could spend your evenings either in a local bar for a few drinks after having dinner in one of the 'tavernas' or on the beach under the starry sky. But this is what makes the village so authentic. For those of you who are seeking the relaxation and peaceful surroundings of Katelios, but would also like to spice up your holidays by dancing the night away, the lively Skala is waiting for you to visit. The main beach of Katelios is called Agia Varvara and it’s a long beach covered with both sand and pebbles. A downside of it might be the amount of seaweed especially at the start and end of season, but as long as you go a bit deeper the sea is crystal clear as everywhere else in Kefalonia. There are a few sun loungers , but because it isn’t so commercialised – as most of the beaches in the area – we suggest that you take an umbrella and all the necessary supplies with you. 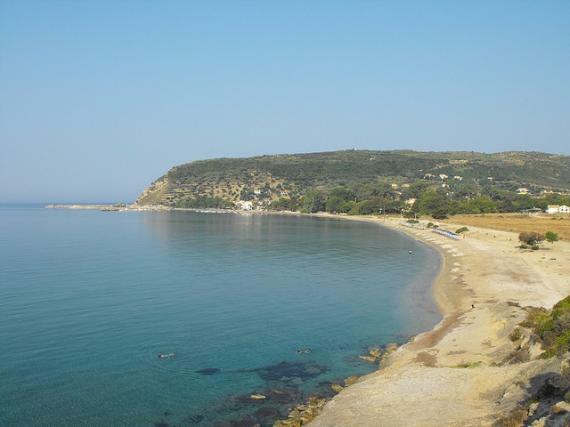 The famous turtle beach near Ratzikli is just 2 km away from Katelios and you could reach it on foot as well. The locals have founded an NGO called “The Katelios Group” for the protection of the loggerhead turtles that lay their eggs on these beaches. If you want to learn more about these animals contact the volunteers of the organisation who will be more than happy to inform you. Even though there aren’t a lot to see in Katelios, if you are interested in the history of the place, you could visit the ruins of the old church in Ano Katelios, which is what is left after the earthquake in 1953, and the Roman ruins behind Agia Varvara. In nearby Mavrata there is a Mycenaean tomb and there is also evidence that Mounda bay used to be a port during the Venetian and Roman period. In the World War II a British submarine was sunk here and the only survivor was found and saved by the locals. If you would like to change your lifestyle even for a few weeks and adopt a more laid back attitude, in the way you would live a few decades ago, away from the hustle and bustle of big cities and the stress of modern life, visit the lovely village of Katelios. Find information about selected Hotels, apartments and rooms in Katelios to choose the perfect place for your accommodation.